Our accessories will remodel your bathroom and kitchen. As a plumbing supplier we have all the bathroom fixtures and kitchen fittings you require. We are a wholly Melbourne Australian company dedicated to bringing our customers high quality products at the lowest prices. With over 30 years experience in the building industry, you can be sure that Kitchen Bathroom Accessories has the right products for you. Whether you are renovating, building new or replacing existing items, our range of watermark taps, basins, bathroom accessories, kitchen remodel fixtures are all selected to enhance and compliment the design of your home. If it's accessories for your bathroom you need KBA has the fixtures and fixtures for all you home improvement and renovation ideas. What's better is the pricing. Complete Sets: This save you big dollars on buying all your toilet and shower accessories in one lot. You get a towel rail, ring, door hook, roll holder, soap dish and tumbler all for a price that others charge for 1 item. Toilet Accessories: Toilet brushes can be the forgotten piece but our toilet brush and holder bring the glamour back to your bathroom. Towel Rails: Only a double rail for you towels give you the best storage for a family worth of towels at a family price. 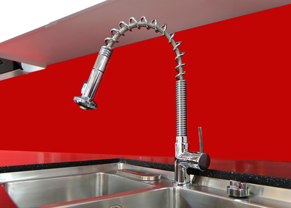 Basin Mixer Taps: Our taps are Watermark approved and include a mixer tap to suit basins or sinks. With no compromise in taste and style you can't look past out watermark mixer taps especially if you want to save in the pocket at well. Vanity Bowls: If you are looking at adding a vanity unit to your bathroom you will need a vanity bowl. Our bowls will complement any vanities with their style and sophistication. Shower Accessories: No powder room is complete without beautiful modern glass shelf, mixer tap or taps, spout or large shower head. Have the best shower with savings in water and in the pocket. Bath Accessories: With spouts, taps and mixers that don't break the bank but make your bath look 1 million dollars you just have to look at our Bath Accessories. 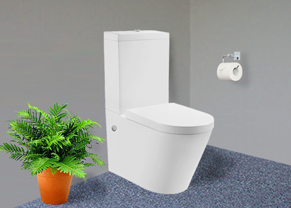 Toilets: Cheap price but quality toilets that are watermark approved and elegantly designed with wall mounting and soft closing lids. Vanity Units: Our units for you vanity come with the carcass so you add tapware and your choice of bowl and bench top. The most important accessory is your kitchen tap and sink. This combination of a mixer tapware and a sink is the star of your room. With our watermark approved quality tap and sink range you can maximise the style of you kitchen at a minimal price. 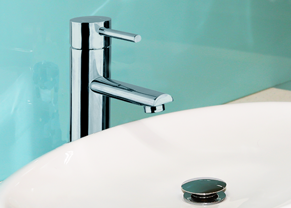 Taps: All our tapware is chosen for its modern styling, lasting quality with a very cheap price. Watermark approved mixers and taps. 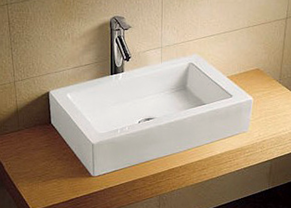 Sinks: If you looking for double or single handmade sinks at great price look no further. For DIY cupboards for your kitchen at the right price you've come to the right place. 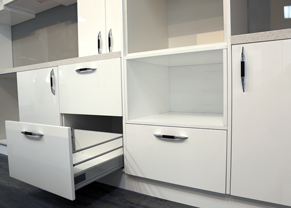 Our cabinet range has white gloss base, tall, wall & pantry cabinets. Each cupboard is pre-assembled (like flat pack) for minimum installation at a minimum price with not comprise on quality. These suit kitchens including modular or DIY kitchens for anyone remodelling or renovating there home. Base: These cupboards sit on the floor in and around your sink, stove and fridge. 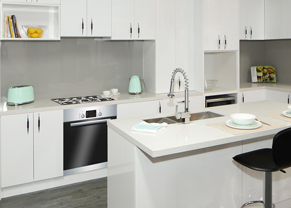 With our modular carcass you can mix and match any of our cabinets to suit your kitchen renovation. Oven & Microwave: These fit around you oven or can have you microwave inside or on top of these cupboards. Base Drawer: These are the lower cabinet that includes a draw or two depending on what you need when renovating. Wall: These are overhead cabinets that are fixed to your wall. These cupboards give you more storage space options in a smaller kitchen area. Tall: Used as pantries or room cupboards they add extra large storage for food containers, breakfast cereal or clothes and shoes. Panels: Panels are used to enclose a carcass, fill in the gaps and add the finishing dressing to your project. White Kitchen: By far our most popular is our white cupboards as nothing is more classic than white or more modern than our self installed cabinets. Kitchen Pantry: Call a larder food cupboard this is the largest cabinet in the kitchen used for storage for food containers, breakfast cereal. Chose Double or single pantries depending on the amount of space need.